Is your mutual fund's return worth the risk? We often invest in funds that have a recent history of performing better than others. Although there is nothing wrong with this per se, one must understand that the performance of mutual funds depends on market cycles, which are always changing. Hence, one must always be on the lookout for the way the market is turning. Fast moving consumer durables, or FMCG, pharmaceutical and banking indices have been the top performers in the last one year, returning 35 per cent, 22 per cent and 16 per cent, respectively. FMCG and pharmaceutical have been the dominant themes for the last five years. The two have returned 21 per cent and 17 per cent a year, respectively, over the last five years compared to a 1.4 per cent return delivered by the Bombay Stock Exchange Sensex. If the market turns bullish, fast moving consumer goods and pharma funds are likely to perform well but lag the broader market. The performance, says Swapnil Pawar, chief investment officer, Karvy Wealth, can be attributed to their defensive nature, which helps them perform well in a bearish market, though they may lag when the market is rising. "Hence, if the market turns bullish, FMCG and pharma funds are likely to do well but lag the broader market," says Pawar. This is reflected in the performance of pharma sector funds. Between January and December 2006, when the stock market was rising fast, Reliance Pharma fund returned 17 per cent compared to a 46 per cent rise in the Nifty. In 2007, the pharma index delivered 16 per cent returns compared to a 54 per cent rise in the index. Mahesh Patil, co-CIO, Birla Sun Life Mutual Fund, says during the 2005-07 market run, investors were chasing growth stocks. With economic growth averaging 8-9 per cent, stocks from infrastructure, real estate, capital goods and engineering sectors looked attractive. Hence, even though FMCG and pharmaceutical sectors did not do badly, their relative performance was subdued. But the downturn that followed made the market more comfortable with these stocks and hence even though their earnings growth is still in the region of 15-20 per cent, the price-to-earnings multiples have expanded at a much faster rate, making them expensive. "If we see a cyclical recovery, these could underperform," says Patil. Clearly, different sectors do well during different periods. For instance, the banking sector has improved its performance over the last six months to one year, returning 18 per cent and 16 per cent, respectively. Incidentally, bank stocks were among the worst performers in 2011, with the BSE Bankex falling 32 per cent during the year. Further, had you invested in banking funds five years ago, you would have earned 7 per cent on an annual basis, in line with the returns from debt funds. Patil of Birla Sun Life says banking went through a downturn after the financial crisis of 2008; the slowing economy hit both credit growth and asset quality. "However, the macro situation is more favourable now; it's the beginning of a cyclical recovery," he says. With this view, fund managers increased allocation to banking and financial sector stocks in 2012. For instance, diversified equity funds increased their average exposure to the sector from 20 per cent at the end of 2011 to 26 per cent in November 2012. Patil says those who had written off the sector could consider investing in it once again. Hope of interest rate cuts, clearance to the banking Bill and strong performance by some private banks and non-banking finance companies are likely to fuel a rally in bank stocks. Gold has also been bitten by the cyclical bug. 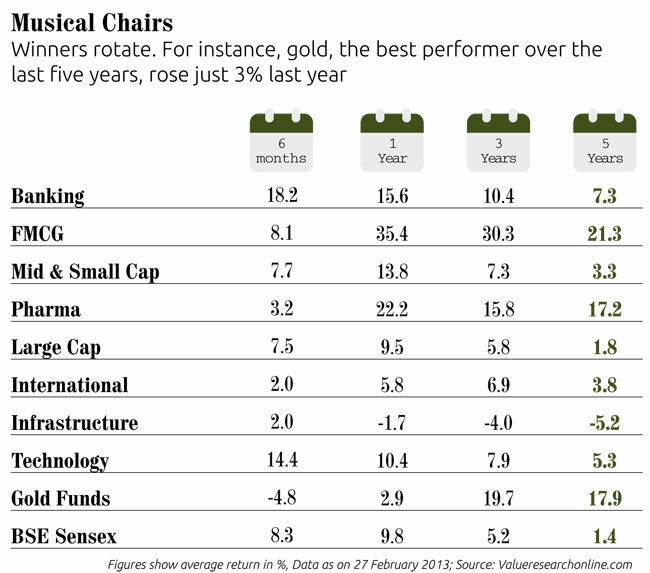 Although gold funds have outshined equity and debt funds by returning 21 per cent a year in the last five years, they have been among the worst performers over the last six months to one year periods. What looked like an unstoppable upward journey after the 2008 financial crisis has slowed considerably, with gold delivering a modest 3 per cent return last year. Patil says gold has been rising unabatedly over the last 10 years, but with economic recovery in sight, equities are likely to perform better. This means gold may not perform as well as other asset classes. "The trend can be attributed to investors' fear about rising prices and doubts about whether the rally is sustainable," says Naveen Mathur, director, commodities, Angel Broking. The trend is not limited to gold. A large number of commodity funds have significantly underperformed the market in the last one year. For example, Birla Sun Life Commodity Equities Fund (Global Precious Metals) gave a negative 27 per cent return between January 2012 and January 2013. Not long before this, between January 2009 and January 2010, it had returned 40 per cent and was among the best performing funds. Similarly, ING Optimix Global Commodities Fund, which delivered 71 per cent return between November 2008 and November 2009, lost 1 per cent value between January 2012 and January 2013. The same has been the case with other gold, energy and mining funds. A large number of commodity funds, says Patil, rallied in 2009 due to a sharp rise in liquidity in global markets and low valuations. Now, with global growth slowing, especially in China, and money from monetary easing throughout the globe flowing into other assets, commodities may underperform. Long-term performances are what matter. If one had taken investment decisions on the basis of the performance of different asset classes in 2007, one would have been stuck with a large number of infrastructure and power sector funds. 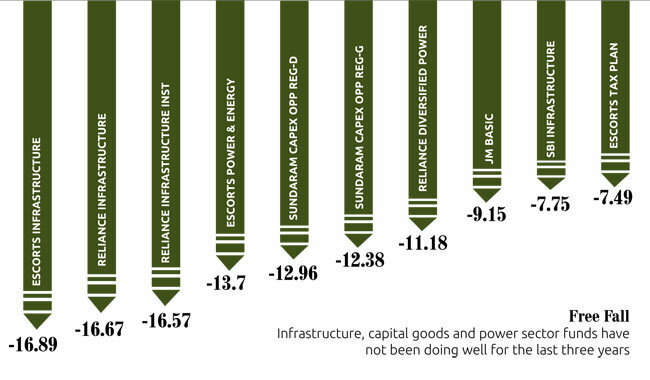 The once super performer, Reliance Diversified Power Sector Fund, which returned 138 per cent between January 2007 and January 2008, has been among the worst performers over the last three and five years. This is true of a number of infrastructure, capital goods, power and energy funds as well. "Fund performances go through cycles and hence rather than choosing the top performing or sectoral/thematic funds, one must go for funds that have been consistent," says Gaurav Mashruwala, Certified Financial Planner. Karvy's Pawar says sector funds are for people who have a clear view of a sector, as their fortunes fluctuate a lot. He says such funds should be held for at least a year as sector performance cycles last for one-two years. For a longterm strategic view, the investor should have a horizon of at least five years, say experts. "One should have a core and satellite approach. The core, that is, the largest chunk, must comprise diversified funds, while thematic funds should account for a small part of the overall portfolio," says Mashruwala. Experts say the latter should not comprise more than 15-20 per cent of the portfolio. Pawar says managers of diversified funds anyway keep changing their portfolios to reflect the markets conditions and there is no need to take a sector view separately. He says investors should learn to ignore the cyclical elements of their funds' performance and hold them for at least three years. Should you opt for e-gold or gold ETFs?